Our (Graham and I) latest campaign is Italy World War 2 using the “Too Fat Lardies” ‘Troops Weapons and Tactics’, with their new “Platoon Forward” Supplement (Suitable for all low level rules, but written with TW&T in mind). We will be following 2 Platoon, B Company, 1 Battalion, Berks, Bucks and Oxon Infantry Regiment, who, arriving in Italy January 44, have been placed with 11 Infantry Brigade. The account of their first action is recounted below. 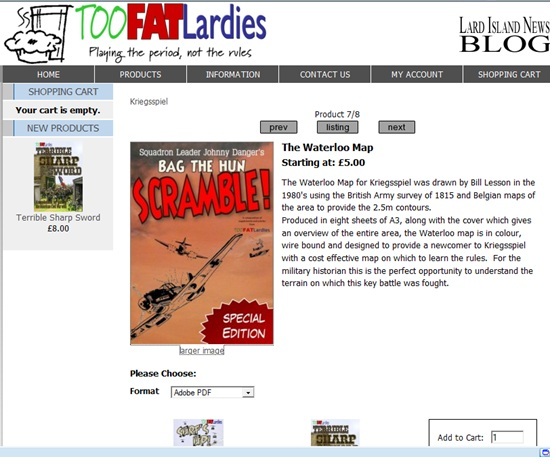 Too Fat Lardies, £10, sent by downloaded PDF. Review of ‘Kiss Me, Hardy’ – Too Fat Lardies. £7 pdf download, approx 50 pages. I had been browsing for a set of Napoleonic Naval wargame rules for some time, and following a trip to Portsmouth, and HMS Victory I started to seriously look out a set. Many sets free on the ‘net appeared to by highly complex, with a large amount of book-keeping necessary. I knew of KMH, and in answer to a question on TMP I was told they were a easy playing set, something a friend confirmed, so I took the plunge and ‘pay-pal’ed the ‘Too Fat Lardies’, having heard good things in general about their systems. On the DP track numbers in red italic are the 5DP point for losing a gunnery factor, and the box with the double/heavy outline is the 50% mark- when you cross this off it is the strike test. The % down the side are the basic strike percentage while any boxes in that row are not crossed out. The track down the side of the rigging boxes is for putting a counter in if you alter sail setting. I trim mine to a 2-3mm outside the border, laminate, then trim these to a few mm all around- enough for the laminate to stick away from the paper. I use OHP/whiteboard type pens to mark off. This means I can just put the whole lot in a basin of water (or once, under the shower) to quickly clean them. See also cards for “Kiss Me Hardy”. Posted the sheets for the smaller ships. Though they did not fight, they had roles before and after the battle. They are included mainly for completeness, but also to allow small actions to be fought- frigate actions were not uncommon.